13 Americans per day were struck and killed while walking from 2008-2017, according to a report released today by our colleagues at the National Complete Streets Coalition. Dangerous by Design 2019 also shows how some of the most dangerous states are, astonishingly, committed to making the problem even worse. Over the last decade (2008 through 2017, the most recent year with data available), drivers struck and killed 49,340 people walking in communities large and small across the U.S. To put that into perspective, it’s the equivalent of a jumbo jet full of people crashing—with no survivors—every month. During a period when fatalities for people inside vehicles went down 6 percent, pedestrian fatalities increased by 35 percent. Since the last version of Dangerous by Design was released two years ago, the problem has only gotten worse: 4 out of 5 states and major metro areas have become more dangerous for people walking. How are states planning to tackle this problem? More than a third of all states aren’t planning to do anything at all. 18 states—including 10 of the 20 most dangerous for people walking—planned to actually increase the number of people killed while walking or biking from 2017 to 2018. New requirements from the Federal Highway Administration require state departments of transportation to set performance targets for traffic fatalities and serious injuries and then monitor their progress over time. Back in 2017, states had to update their safety goals for 2018, which included setting target numbers for deaths and serious injuries among people walking, biking, or using other non-motorized forms of travel. Did states respond by setting ambitious targets and creating accompanying plans for how they’d spend their share of billions in federal transportation dollars to make their streets safer for everyone? Unfortunately, a closer look at these targets reveals just how low the bar is for safety in many states. 18 states established targets for non-motorized deaths and injuries that are higher than the number of people killed or injured in the most recent year of data reported. With billions in 2018 federal transportation dollars available to them to devote to improving safety, more than a third of all states committed to…doing what they did last year—or worse. 10 of these 18 states are among the top 20 most deadly according to Dangerous by Design 2019. The only “acceptable” number of deaths on our roadways is zero. We can and must raise the bar by requiring states to set safety targets that reduce rather than increase the number of people killed or seriously injured while walking or biking on our streets, ultimately working toward eliminating all traffic-related deaths and serious injuries. However, to make this vision a reality, we need strong federal policy with binding enforceable requirements that hold states to higher safety standards. Dangerous by Design 2019 helps make this case. For more information on epidemic of people struck and killed while walking and to see the full rankings of the top 20 most dangerous metro areas and states, view the full Dangerous by Design report. 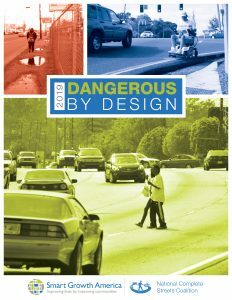 This content, adapted from Dangerous by Design 2019, was co-authored and edited by T4America staff. Visit our one-stop hub for resources on state efforts to improve policy and raise new funding for transportation. Enter your email address to receive all blog posts & releases via email. KC Streetcar supports jobs locally and across the U.S.
Transportation for America is an alliance of elected, business and civic leaders from communities across the country, united to ensure that states and the federal government step up to invest in smart, homegrown, locally-driven transportation solutions — because these are the investments that hold the key to our future economic prosperity. © Copyright 2013-2017 Transportation For America | All Rights Reserved.